Mouse Monster Art Show is coming April 30th! The Rockin Roses Gallery in Healdsburg will be hosting the Mouse Monster Art Show on Saturday April 30th from 5:00 – 9:00 pm. Stanley Mouse’s knuckle-dragging monsters, crazy-boss hot rods and super-cool choppers will be there, featuring 10 new Monster & Hot Rod releases! Mouse will also introduce new paintings from his monster art genre and be available for signatures on newly released Giclee art prints of his work. 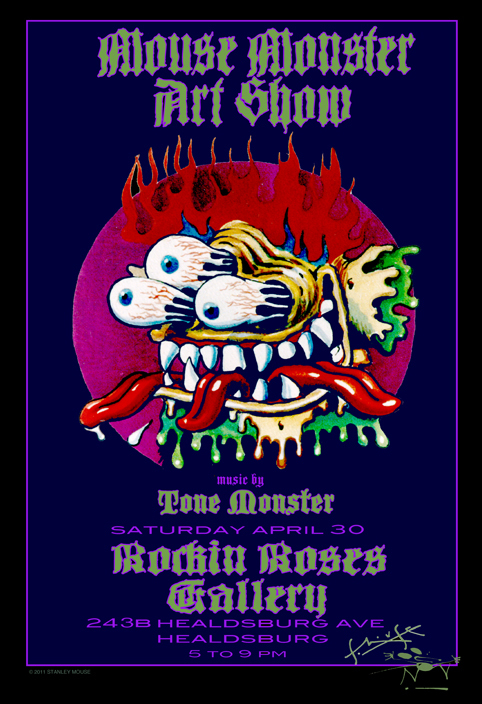 Music will be provided by Tone Monster, Sonoma County’s sonic-rockinest band. Monster Art is in the full swing of its renaissance in the states and Japan. It’s fun stuff. We hope to see you there.